When summer arrives and the air around my garden is redolent with the rich, sensual aromas of blooming plants, my essential oil preferences turn towards the classic florals, like Lavender, Ylang Ylang, Geranium and Rose Geranium and the heady, seductive enfleurage extractions like Gardenia and Tuberose. Flowers are the essence of summer and the exquisite aromas of the essential oils extracted from flowers are one of nature’s greatest gifts. Two of my favorite floral essential oils are Geranium and Rose Geranium, the latter being a variety of the former. Both of these essential oils have beautiful aromas and very similar properties and uses but it is the Rose Geranium that I love the most and that I have selected for Artisan Choice members this month. The information contained in this report is for educational interest only and is not intended to stand as claims for actions of the products “Geranium Essential Oil” or “Rose Geranium Essential Oil”. It is additionally not intended to be used for diagnosis or treatment of any physical or mental illness or disease. For many people, Geraniums conjure up visions of the showy garden plants with big red, pink or white flower heads and rather large leaves. These are the Geraniums seen in many garden centers and known botanically as Pelargonium x hortum. As lovely as these plants are, they usually have comparatively little scent and are not the source of the Geranium essential oil used in aromatherapy. The Geranium and Rose Geranium essential oils used in aromatherapy are usually said to come from Pelargonium graveolens and Pelargonium graveolens var. roseum, respectively, although there has been much debate on this issue and some authors report Pelargonium capitatum, Pelargonium asperum or Pelargonium cv. rosé as the common sources. Patricia Davis said that the Geranium essential oil used in aromatherapy derives from Pelargonium odorantissimum. This issue is not easily resolved and I have seen Geranium and Rose Geranium essential oil sold by distillers under all these names. The Geranium and Rose Geranium essential oils sold by Artisan Aromatics are distilled from Pelargonium graveolens and Pelargonium graveolens var. roseum. The Pelargoniums are native to South Africa and you may know them as “scented Geraniums.” There are many varieties of scented Geraniums that include representatives of several Pelargonium species, including those named above and others. There is even a so-called chocolate scented Geranium! Some other scented Geraniums can be distilled for essential oil but most of these products are not available on the market.One more important point to make about the botanical classification of Geranium and Rose Geranium as we know them in aromatherapy is that these are not the so-called “true” Geraniums which are referred to as “cranesbills” and which belong to the Genus Geranium. The plant known to herbalists as “Herb Robert” (Geranium robertianum), is a cranesbill; it was used in European herbal medicine as a remedy for toothache, nosebleeds, and wounds and has been said in some old herbals to be a treatment for cancer. Pelargonium graveolens, on the other hand, was not much used by traditional western herbalists, although an exception is discussed below in the review of historical reports and folklore. Today most herbalists use Pelargoniums only as essential oil. Some of the properties that have been attributed to “Geranium essential oil” by early aromatherapists, such as Jean Valnet, appear to have been taken from the old herbal literature on Geranium robertianum and should not have been attributed to the essential oils derived from the Pelargoniums. This has led to the spread of misinformation about the properties and appropriate uses of Geranium and Rose Geranium essential oils, and I have tried to avoid falling into that trap by preparing this report. The essential oils of Geranium and Rose Geranium are steam distilled from the leaves, stalks and flowers. The yield of oil is fairly small with most of the oil coming from the leaves. Pelargonium graveolens is grown for essential oil production mainly in Egypt, China, Morocco, Crimea, Ukraine, Georgia, India, and South Africa. There is also some small scale production in Italy and France. The name “Rose Geranium” was traditionally applied to the essential oil extracted from a specific cultivar of Geranium, known as Geranium Bourbon, which was produced on the island of Reunion (a French holding formerly called the island of Bourbon). Geranium Bourbon is currently produced only in small quantities and is not widely available but “Rose Geranium” essential oil is now produced in other countries as well. The Rose Geranium essential oil that I have chosen for Artisan Choice members this month is a fine selection from France. The essential oil of P. graveolens is colorless to greenish-brown and has a beautiful, heavy, sweet, floral aroma with nuances of rose; Rose Geranium has the best rose notes and many people prefer its aroma. Both Geranium and Rose Geranium are sometimes used as adulterants to “extend” real Rose essential oil. Pelargonium species (probably P. sideoides) have been used medicinally by the Hottentots and Zulus of South Africa for hundreds of years for dysentery, coughs, upper respiratory irritations, gastritis, tuberculosis, and other problems. In 1897, an Englishman named Charles Stephens was treated for tuberculosis by a traditional healer in South Africa who gave him an herbal decoction of the local Geranium. Stevens is said to have been cured and he subsequently returned to England and sold the remedy as “Stevens’ Consumption Cure.” During the 1920’s a Swiss physician, Dr. Adrien Seche, reportedly used Stevens’ Consumption Cure to treat and cure 800 patients with tuberculosis. Geranium and Rose Geranium essential oils have virtually the same properties and uses and for most purposes can be used interchangeably in aromatherapy. If a client has a preference for one over the other, however, it is advisable to use their preferred choice. Geranium and Rose Geranium essential oils have been said by aromatherapists to have uplifting, antidepressant properties, which they reportedly share with almost all other floral essential oils. They have been used in aromatherapy for female hormonal issues such as menstrual problems (especially menorrhagia), PMS and menopausal symptoms. Both are used in skin care (fungal infections, oily skin, minor wounds/bites, and pressure ulcers) and for musculoskeletal problems (arthritis, rheumatism, aches and pains). 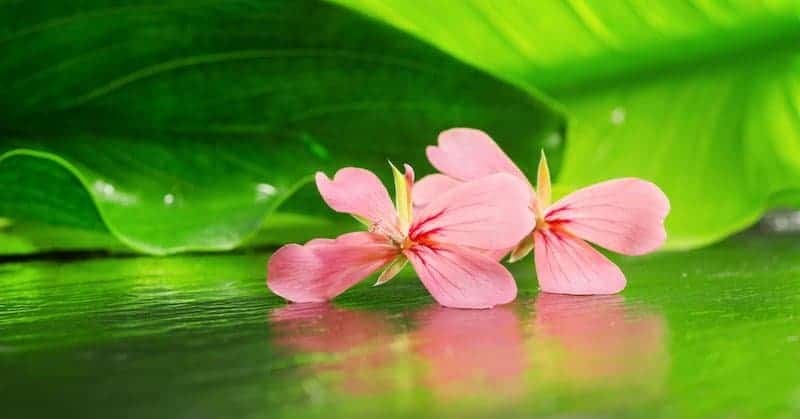 According to Patricia Davis1, Geranium essential oil balances the production of natural skin oils such as sebum, an action which she says arises from the fact that it is an adrenal cortex stimulant. Geranium essential oils have reportedly been successful in managing the peripheral neuropathy of diabetes and neuralgic pain of various types and have been said to help regulate blood sugar. They are reported to stimulate the circulation of lymph and blood and have been used in sprays for varicose veins and in facial creams to help reduce thread veins. I have found the Geranium essential oils to be useful for discouraging gnats and mosquitoes. Geranium oil has been described as a tonic of the Spleen/pancreas (Earth element) and has been claimed to have beneficial actions for people who complain of exhaustion and lethargy coupled with diarrhea, lymphatic congestion and body pain related to lymphatic congestion. It is said in Chinese Medicine that in addition to clearing heat and inflammation from the body, the Geranium essential oils also clear heat from the mind when it’s inflamed with agitation, frustration and irritability. Like all yin tonics, these essential oils are said to have a strengthening, centering effect on the Mind and Spirit. Geranium and Rose Geranium essential oil are considered generally safe for external use. While Geranium essential oils have been classified as strong sensitizers by the European Union, Tisserand and Young (2014)3 summarized studies on skin sensitization and concluded that there is only a low risk. Nonetheless, careful use (proper dilution) on the skin is advised and frequent use on the skin should be avoided. I also recommend avoiding topical use of these essential oils on people with a high risk for sensitization reactions (i.e. when there is a history of similar reactions and/or a history of “sensitive” skin). Some authors have recommended avoiding Geranium and Rose Geranium essentials during pregnancy and in the presence of estrogen-dependent cancers. On the other hand, Geranium essential oil is not on Tisserand and Young’s (2014) list of essential oils contraindicated during pregnancy. Significant drug interactions may occur with oral use of Geranium and/or Rose Geranium essential oils. While I do not recommend oral use of ANY essential oil by persons who lack appropriate training in oral use, it is especially risky with Geranium and Rose Geranium essential oils, which have been shown to interact with diabetic medication and which could theoretically also interact with any drug, such as cyclophosphamide, which is metabolized by CYP2B6 enzymes (ask a pharmacist about any medications you are taking). No drug interactions are likely with standard topical use or inhalation of small amounts. Davis, P. (1988) Aromatherapy An A-Z. Saffron Walden: C.W. Daniel Company. Pg. 143. Bakkali. F. et al. (2008) Biological effects of essential oils – a review. Food and Chemical Toxicology, 46 (2): 446-475. Boukhris, M. et al (2012) Hypoglycemic and antioxidant effects of leaf essential oil of Pelargonium graveolens L’Her. In alloxan induced diabetic rats. Lipids in Health and Disease, 11 (81): 2-10.